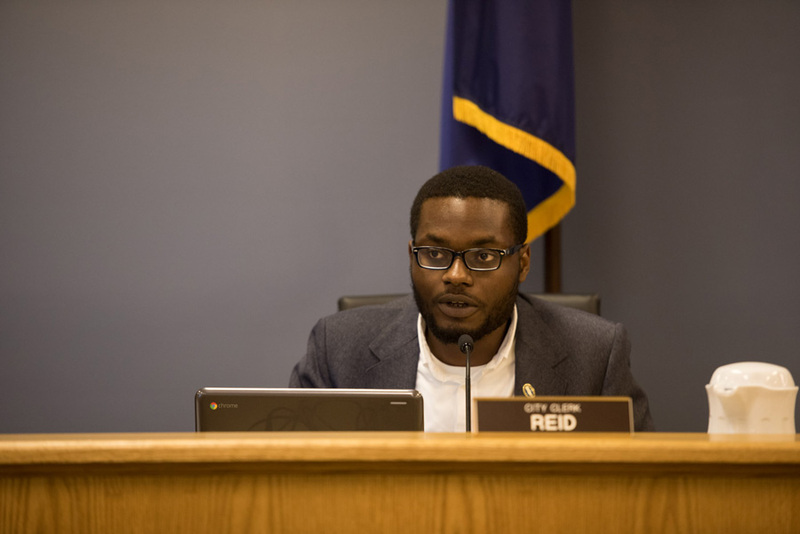 City clerk Devon Reid speaks at Monday’s City Council meeting. Reid said the city plans to implement a series of changes to the online Freedom of Information Act request system following a controversy in which the database disclosed confidential details. City Council voted to make the online database containing Evanston’s Freedom of Information Act requests private after it publicly disclosed the names of juvenile offenders and survivors of sexual assault. The NextRequest database, which launched in February 2016, allows Evanston residents to request access to public records in accordance with Illinois FOIA amendments. To prevent duplicate requests, residents can view all previous inquiries on the website. However, Ald. Donald Wilson (4th) said the posts included sensitive information about minors that was never redacted from public view. Wilson said this can happen when Evanston parents looking to expunge their child’s record file a FOIA request and inadvertently create Google results linking the minor to the crime. The database will be removed from public view until the city’s law department can review materials to eliminate any remaining private information. For the time being, requests for police reports will only be visible to those who submit them. Wilson said the city will still be responsive to FOIA requests so residents can access public information. NextRequest is maintained by city clerk Devon Reid’s office. Wilson said the privacy issue was mentioned to Reid “multiple times,” including once last week. Wilson said Reid did not remove any of the posts in question. Reid, however, disputed Wilson’s account and said the reports in question were removed after auditing the website. The city plans to implement a series of changes to the database, Reid said. Currently, residents must contact the city clerk’s office if they wish to have a FOIA request removed from the website. Reid said modifications will include an hour-long embargo on submitted FOIA requests to allow administrators to redact names from public view. Reid said he only plans to provide unredacted records to verified requesters, such as family members of the juveniles. Specific improvements to the system will be discussed at the next Rules Committee meeting, including the designation of a FOIA officer to replace the city clerk’s office in maintaining the database.